Choose between a standard rectangular desktop or a curved shape with a center-cut out for your UPLIFT Standing Desk. Available in standard or dark color options. The UPLIFT Standing Desk with 1" Thick Bamboo top is available in several standard sizes. All desktops are 30 inches deep and vary from 48" to 80" wide. If you're looking for a real genuine bamboo desk that can help you accomplish more throughout the day (and look great while doing it), the UPLIFT V2 Bamboo Stand Up Desk is here to deliver that, and so much more. The height adjustable desk that puts all others to shame, get ready to add environmentally friendly to the already long list of features. Picked as the "Best Standing Desk" by both Wirecutter and now Forbes, our designers included a whole host of new features in the UPLIFT V2's design, with improvements in stability, safety, and functionality. Our bamboo desktops are sourced and made via methods that are safe for you and the environment. It's constructed from Moso bamboo that's free of pesticides, fertilizers, dyes, and stains; to get its beautiful colors, we carbonize our tops, bringing out the natural golden to light brown colors in its grains. At a full 1" thick, our bamboo tops are over 25% thicker than most tops, giving you extra stability and even more surface area around the edge of the desk—letting you show off the finer details in its edging. We have two options for the desk frame—the UPLIFT V2 and UPLIFT V2 Commercial. No matter which frame you end up choosing, we know you'll love your UPLIFT V2 Bamboo Stand Up Desk today and for years to come. Click here to learn more about both of them and compare their differences. Want to see all desktop options we have? See our comprehensive Desktop Brochure. 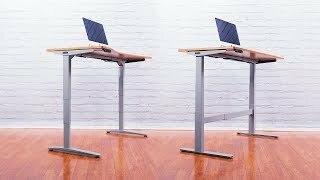 Want a desktop paired up with UPLIFT Desk's V2 Frames? Shop our UPLIFT V2 Height Adjustable Height Desks. Easy on the eyes and Mother Earth, our bamboo desktops are made from fast-growing and sustainable Moso bamboo, which is technically a species of grass. Expert desk makers source the material from forests in Asia, then harden the reeds and carbonize or "caramelize" them, to bring out unique, rich colors that vary from light golden brown, to dramatic shades of dark honey brown in our dark brown tops. You'll love the grain patterns on its top and edges. You'll have your choice from a rectangular or curved desktop on your desk. Our curved desktop style boasts an inner edge cutout that lets you sit closer to your work, with a shallow bevel to cradle your wrists in the edge closest to you. The main difference between the UPLIFT V2 and UPLIFT V2 Commercial is their height range. Want to see a quick summary of the differences? Click here for a detailed look at what sets these frames apart from each other. For starters, the UPLIFT V2 Frame comes with a height range of 25.5" - 51.1" (with a 1" desktop installed), a range generous enough for most people and projects. Packed with advanced safety features, you can work with confidence that your desk will be safe at home and in the office. It also meets ANSI/BIFMA durability standards. The UPLIFT V2 Commercial Frame, on the other hand, features a height range of 22.6" - 48.7" (with a 1" desktop installed). That means this commercial-grade desk has a lower starting height, a lower max height, and a larger overall height-adjustment range than the UPLIFT V2 Frame. To increase stability, UPLIFT Desk included a lower stability crossbar in its design. Created specifically to meet the ANSI/BIFMA G1-2013 height standard, which is required by a lot of the world's largest companies, it also meets the ANSI/BIFMA durability standard. The UPLIFT V2 Commercial Frame also supports ergonomic working postures for 5th percentile females through 95th percentile males, in positions for both sitting and standing. The frame on your UPLIFT V2 Standing Desk comes with a hidden secret underneath—a system of 48 individual mounting points that allow you to install accessories directly to your frame. All discreetly built into the frame, these holes allow you to attach things like desk extensions, CPU holders, and power strips to your workstation. You'll even have the option to add an under-desk hammock to yours, for those afternoon power naps (available now). Note: the hammock is only compatible with the UPLIFT V2 Frame, and is not compatible with the UPLIFT V2 Commercial Frame because it interferes with its stability crossbar. Save time when raising and lower your desk and enjoy all of the features of the UPLIFT V2 with the Advanced Keypad. Work with easy one-touch adjustments on four programmable memory buttons. Transition from sitting to standing postures in seconds—just by picking your preferred preset on the smart keypad. Installing this keypad gives you advanced safety features, too, like anti-collision sensitivity and keypad child lock, making your desk the safest one in the office. Rest easy that your desk will only move when you want it to, and if it does come into contact with things in its environment, it's intelligent enough to know to stop. The desk's maximum and minimum heights are also adjustable; set its upper and lower height limits, preventing your desktop from hitting shelves above, or file cabinets below, ever again. Lastly, to reduce distractions, an auto-dark LED display will dim 10 seconds after each use, letting you keep your focus on your work and not on your beautiful new keypad. How is this bamboo desktop different from others on the market? UPLIFT Desk's bamboo desktops start at a full 1" thick, which is a whole 25% thicker than other desk manufacturers offer. We also think it looks prettier, too. Is this a veneer of bamboo or solid? All bamboo desktops made by UPLIFT Desk are constructed from 100% solid, pressed Moso bamboo. They are not veneered, in other words. Is this desk durable enough for me? Yes, bamboo makes a fine desktop option for most setups and tasks. Did you know that bamboo reeds are 40% harder than oak? And at a whopping 1" thick, you don't have to worry about your bamboo desktop sagging or bending, even if you choose a wider desk, like our 72" wide desktops. Take a look at our tops—our carbonized bamboo desktops' color can best be described as a yellowish-brown honey color. But keep in mind, since each desktop is composed of 100% real bamboo, each will be different and contain unique variations of color in each. This is 100% solid bamboo that has been pressed together to form a durable desktop that you'll love to work at. Do you seal or finish the bamboo? Yes, our bamboo is sealed with a safe, toxin-free clear coat that protects it against wear and tear, giving your desk a long life. Why is your bamboo desktop as affordable as your laminate desktops? We're glad you asked! Since bamboo is a species of grass, it grows at a fast pace. The bamboo that is harvested to make our bamboo tops is readily available as compared to our reclaimed or solid wood desktops, which is something we took into account when pricing our tops. This lets you get an eco-friendly desk that sports a similar look to real wood, but at a fraction of the price! Would you say this bamboo scratches easily? The bamboo is very durable, but that doesn't make it unscratchable! We suggest taking it easy with writing directly on your desktop or placing sharp objects on top, as these can dent and scratch its surface. We sustainably source our bamboo from Thai and Chinese forests. How should I care for my desk? To keep dust from collecting on your desk, we advise wiping it down with a microfiber towel every once in a while. For a deeper clean, all you should need is a towel with warm water and gentle soap. Do I need to worry about drilling through my desktop if I mount my desk accessories? No, you shouldn't. Bamboo is an extremely durable material that holds up well, even when you drill into it to mount your accessories. However, we do advise double-checking that the screws you are using are no longer than 1" thick before you install anything. Attaching the frame to the desktop can definitely be done by one person. However, we do suggest you have a friend's help to turn the desk right-side up after you put it together. Check out our video showing just how easy it will be to assemble your UPLIFT Desk. At this time, we don't offer sample pieces of the 1" thick bamboo desktop. But you are always welcome to come on down to our Austin showroom to see all of our beautiful desktops in person! I highly recommend this desk. I love being able to stand while I work or sit down by simply pushing a button and rolling my chair over. I 6'5 and this is just tall enough for me at the highest setting. Get the memory keypad, it is very much worth the extra money. I got the motion x board and I like it as it gets me moving while I work instead of standing still but I would recommend one of the motion boards with some padding as my feet start to hurt standing on a wood board all day. The desk is not wobbly with my four 27" screens on it. I will be buying more of these for the rest of the office in the future. I purchased the contoured bamboo top 60x30 desk with the metal drawer that includes a shelf. Also purchased the expanded wire management and a metal channel for the side. The salespeople were professional and patient as I waorked through the options. The delivery guys also did assembly - efficient, professional, friendly and worth the added cost. The desk top is welll constricted and beautiful, with a nice finish and the contour adds significantly to the the aesthetic. The black frame also has an excellent finish. The lifting mechanism is smooth, quick and quiet enough that it doesn’t bother my office mate. It is quite stable at standing heights. My only fault is that the magnetic channel is not as good as I hoped in that any pressure from the cords causes it to slip a little. I could probably remedy this with wire ties in the cords but haven’t gotten around to it. Read plenty of reviews from users and publications that claimed this is one of the best standing desks out there. They were 100% correct. Years ago, I had a Jarvis desk. It was good, but there were nitpicky issues here and there that made me like it less. Uplift fixed every minor and major issue I had. I am impressed and glad I chose to buy from them instead of getting another Jarvis. The sales team was awesome and helpful. Very informed and made purchasing as easy as could be. Can't thank them enough. I am impressed with the quality of this desk. I didn't want a stand up desk that only moved my PC up and down. I wanted access to the whole desk. The construction is solid and very sturdy. The bamboo wood is very high quality. This is the best stand up desk on the market, by far. I got the 60" bamboo top with the curved edge and black legs and 2 grommets. The look is modern and clean. I also bought a black desk pad to go on top. The edge has a scratch already (everyone in my family denies scratching it), so I'm not sure how it happened. I'm thinking belt buckle rubbed against it as it was going up? Not sure, so be careful with your desk. I also have 2 monitor arms. When you have 2 arms and 2 grommets, you are limited as to where to clamp the arms and still have the monitors meet in the middle. I shifted the arms a little to the right (ie there is more desk space to the left of the left monitor than the right monitor, so the arms cannot be perfectly centered on the desk due to the grommets). Just something to keep in mind as you are configuring your desk. I also got the half circle "drawer" as part of a complimentary package that came with my desk. The front curve of the desk meant that the drawer couldn't be placed all the way to the far side of the desk (it has to be placed closer to the middle of the desk) in order for it to align with the front curved edge when the drawer is rotated to the "closed" position. This would have been good to know in advance. If you are getting the half circle drawer, you may not want to select the curved edge. It is workable, but if I had known this in advance, I would have not chosen the curved edge. This is harder to explain in words, but if you saw a picture, you would understand immediately. I got the 72" bamboo top stand up desk with the TR1200-DT3 walking treadmill and am very happy with both. Before buying, my biggest concern with the desk was that it would be too wobbly at standing height, especially with the 72" width and my dual monitor arm setup. But I haven't had any problems with wobble. This desk is solid - you have to bump it pretty hard to get it moving. The desk top is very smooth. Great for writing. Overall, it feels like a lot of work went into the design. I also got the 1-Touch Digital Memory keypad, and highly recommend it. Great desk and the sustainable 6 ft bamboo top with the black frame is a hit in the office, everyone wants one ! It is nice to be able to switch from sit to stand without a hassle. I recommend the memory option, coworkers will be using your desk when you are not around and you want to be able to get your ideal settings back quickly. As a safety director I am very happy with the desk and even happier I was able to test it for our offices. A co-worker told me his son has a reinforced version at home to support three monitors. Many options and a very sturdy desk, we will likely buy more. Let me start by saying, my Neurosurgeon, said because of my sedentary job I should get a sit to stand desk. Therefore, I got the 72"x30" 1" thick bamboo ergo cut desk. I received the desk in several boxes. They were very heavy. When I opened the boxes, I checked inventory and everything was there. I did have one grommet which was broke (More on that in a minute). Instructions were easy to follow. The desk is good quality. The legs themselves have substantial weight, but also good quality. I'm not a very handy person. However, with the instructions, and rereading to ensure I was getting it right, I was able to build the entire desk within 1 to 1.5 hrs. Now about that grommet. I called customer support, explained my issue, and they had me send a picture of the broken grommet. They sent a new grommet without question and I received it about a few days later. Great Customer Service! Great Desk! I'm extremely happy with my purchase.